Are you and Ann going home for the holidays? Good! I'm glad you made it home safely. I'm sure the godkins were happy to see you. They seem happy! Loki has been extra cuddlesome. It's been so good to see them! Thanks! Pinched it via Google! I assume you're going to your parents and cats for Christmas? Yes, I'm at my parents' place until Saturday at least. 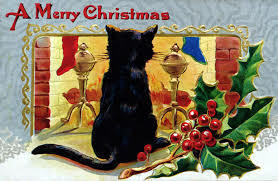 Thank you - what a lovely card-image. I hope you're having a great Christmas. Thank you. I hope you and R have a good time.